Description: This reference text provides a complete instructional overview of the workings of the library media center—from the basics of administration, budgeting, facilities management, organization, selection of materials, and staffing to explanations on how to promote information literacy and the value of digital tools like blogs, wikis, and podcasting. Since the publication of the fourth edition of Administering the School Library Media Center in 2004, many changes have altered the landscape of school library administration: the implementation of NCLB legislation and the revision of AASL standards, just to mention two. 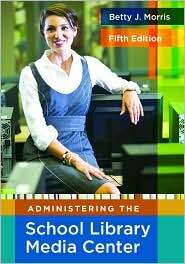 The book is divided into 14 chapters, each devoted to a major topic in school library media management. This latest edition gives media specialists a roadmap for designing a school library that is functional and intellectually stimulating, while leading sources provide guidance for further research. Tseng, H. W., Tang, y, & Morris, B. (2014). Are they instructional effective? Evaluation iTunes U courses through m-learning pedagogical framework. Presentation for the annual meeting of the Association for the Advancement of Computers in Education (AACE/SITE). Jacksonville, FL (March 2014) (proposal accepted but unable to attend because of funding issues). Morris, B. Tang, Y., & Tseng, H. W. (2013). Distance learners self efficacy on information seeking and preferences of resources selection. Presentation for the annual meeting of the Association for the Advancement of Computers inEducation (AACE), Las Vegas, NV (October 2013). selection. Presentation for the annual meeting of the Association for the Advancement of Computers inEducation (AACE), Las Vegas, NV (October 2013).